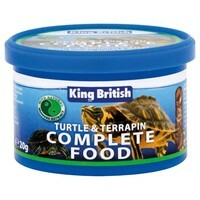 King British Turtle and Terrapin Complete Food is high in calcium to ensure good shell condition and healthy bones. Containing a natural blend including freeze dried shrimp, krill and vegetable pellets this diet is delicious for turtles and floats to encourage natural feeding habits. Made with all the essential vitamins, minerals, trace elements, amino acids and vitamin C, King British Turtle and Terrapin is made from the highest quality natural ingredients. This nutritious blend including food pellets (50%min), freeze dried natural ingredients including krill (8%min), gammarus (12%min) and shrimp (22%min). Feed sparingly twice daily. Do not overfeed.